I found this on Scholastic’s website. I hope that it’s useful. Lowe’s Toolbox for Education grant program finances school-improvement projects initiated by parents. Maximum Award: $5,000. Eligibility: K-12 schools (including charter, private, and parochial schools) and parent groups associated with a nonprofit, K-12 schools. Deadline: Oct. 17, 2008. 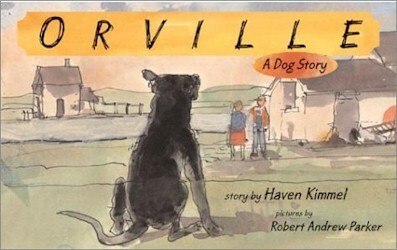 Orville (2003), written by Haven Kimmel and illustrated by Robert Andrew Parker, was such a cute little story. It was one of my purchases from the .99¢ store last summer. Consequently, it was also one of the books that I gave away for joining my book club. Orville lay down in the culvert, covered his eyes with his paws, and decided to never get up again. All night, he lay wet and shivering. In the morning the sun broke through the clouds, brighter and warmer than he’d seen it for months, and he forgot he had vowed to never rise again, and rose and stretched. This book is a heartwarming story for dog lovers. It’s the story of a big, ugly dog name Orville. He was taller than a pony, and had a big square head and a black face with a brown patch over one eye. His left ear looked okay, as ears go, but his right ear bent in the middle and flopped up and down when he ran. He didn’t run much anymore. Orville’s spirit has been nearly broken. He’s about ready to give up, when he’s found by a farmer and his wife. His name was Herbert. Her name was Maybelle, but everyone called her May. Maybelle offered her had, Orville smelled it because when he did he could see into people’s hearts and smell their dreams. Suddenly, from that moment on, he knew that he liked her. Orville became so excited, he began to run in circles. The farmer took one look and decided that Orville was the ugliest dog he’d ever seen. But, since the farmer’s wife thought he’d make a good watchdog, he went home with the farmer & his wife. The farmer thought Orville was much too big and too wild to run free. So, he was chained to the barn. This was the worse thing that could have happened to Orville. He became angry and started barking. Herbert told him if he kept barking, he’d send him to the pound. Suddenly everything changed. A cotton-candy haired girl named Sally moved into the little house across the road and Orville fell in love. In order to be near her, he broke the chains- the only thing keeping him from her. He got into Sally’s house just to look @ her and watch her dream. Maybelle showed up and tried to make him leave. He wouldn’t budge. It took the volunteer firefighters to get him to leave. That didn’t stop him though. Night after night, he broke his chain to visit Sally. What happens after that is so sweet. But I guess you’re going to have to read it to find out what. Trust me, you’ll love it. Although I don’t really like dogs, this isn’t a story about dogs. It’s a love story. Read it for yourself and find out. You’ll be glad you did. My students may not be up to par in academics, but they are way above par on many other things. What they lack in writing, and/or reading skills, they make up for in verbal skills and enthusiasm. They are very verbal in a good way. They are also very observant. They notice everything. When I noticed that they were excellent and observant conversationalists, I decided to play up those strengths. That is how we came to have a very good conversation about this book. I originally purchased this book because a couple of my students were struggling with differentiating vowels and consonants. I found this book and thought that it was the perfect vehicle for that. I liked this book for obvious reasons. Firstly, it’s what KRS-1 of BDP fame would call edutainment. It’s education mixed with entertainment. When I read this book, I knew that it definitely fit the bill. Secondly, as there are distinct parts, the book lent itself to being acted out, as my students did during one of my university supervisor’s visit, and she loved it; I came out looking like a star. First I read the book, then (once Man-Man suggested acting it out) I assigned parts. If you will notice the red and blue planes on the front cover of the book, you’ll notice that one is a vowel (E), and one is a consonant (T). I didn’t notice when I was reading it, but Man-Man did. He noticed everything. Synopsis: Ever since anyone could remember, there has been contention between the Vowels & the Consonants. Every Consonant knows that you never trust a Vowel. And every Vowel knows that you don’t trust a Consonant. “Who could imagine what horrible things a gang of roving Consonants might do to an unsuspecting Vowel?”says a consonant. The Vowels tended to be smug and stuck up. After all, there were fewer of them. Surely, they felt, that made them better than the common Consonants. “AAAA and UUUU–what sort of noise is that for a letter to make!” Consonants preferred their own sounds: PRGHT! or SSSSP! Good, strong, snapping noises. So began the historic & epic war between the Vowels & the Consonants. They continue to fight until a third party, a mutual enemy, comes into the picture. What happens??? Do they make up? Do they bridge the great divide between Vowels & Consonants? Does the mutual enemy divide them even further??? Well, I guess you’re just going to have to read it and find out for yourself. Trust me, you will not be disappointed. A couple of weeks ago, I reviewed its’ companion book Among the Odds and Evens. They can both be used to teach their individual concepts. Do yourself a favor and pick it up! While this book is made for 2nd grade and up, I’d say that younger children would still enjoy the book because of the cute little illustration. Those who will appreciate this book more are those who know or at least have a cursory understanding of what vowels and consonants are. Ever since my friend Jessica introduced me to Joey Pigza, a book about a child with ADHD, I have been on a quest to find other books for tweeners and young adults that deal with the subject of learning disabilities. 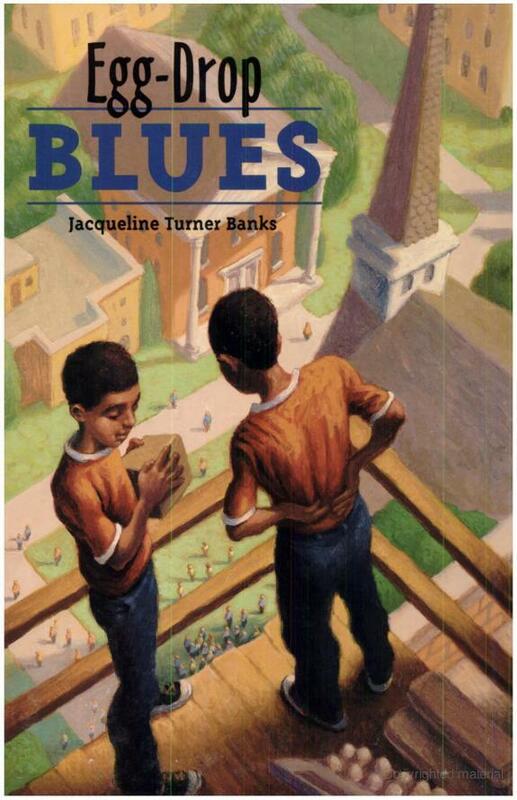 That’s why I was so happy that I found this book by Jacqueline Turner Banks called Egg Drop Blues (2003). Although I thought the title was kinda’ odd, I gave it a shot anyway. Reading this book gave me a chance to expand my horizons to chapter books. I don’t recommend a book unless I’ve personally vetted them. It is vitally important that I be able to recommend books to my growing children and to my students. I have been searching for young adult novels that deal with disabilities. Not in a slap you in the face kind of way, but in a subtle, by the way, kind of way. When I first read it, I thought that it needed a tad more information about dyslexia in there. Then I thought about what a tweener or young adult would want to read. If it was too boring, then they wouldn’t want to read it. In order for young people to want to read it, it had to have all the things that a good book has + a little information on the disability (without reading like a text book). In other words, it had to be a good book even if it didn’t have the information about dyslexia in it. Did this book accomplish that? Yes, it did. I think that any young adult with dyslexia would enjoy this book. I haven’t asked anyone else to read this and critique it for me, so I can only give my opinion. The book was an easy read. It met the criteria mentioned earlier of being able to stand alone, as if dyslexia were not part of the equation. I would use this book for bibliotherapy (book therapy). I definitely believe in bibliotherapy, especially for children. If you don’t know how to break some type of news, or if the child isn’t listening, books are one of the best ways to get information across. Synopsis: Twins, Judge & Jury Jenkins, are the stars of this story. The story centers on Judge, the twin with dyslexia, who is not doing so well in school. Not wanting to split the twins up, but wanting to get help for Judge, their mother tells them that she is going to send both of them to a special private school on the other side of town where the bourgeois people send their children. Jury feels caught in the middle because he isn’t the one with the disability, his brother is. Judge doesn’t want to go to a special private school and neither does Jury. Judge asks if they can stay at their current school if he pulls his grades up. His plan: win the science fair egg-drop contest, for which his grade will be raised a whole letter grade if he and his brother places in the top 5. In addition to all the drama going on with Judge & Jury, they find out that their father’s new girlfriend may be their new step-mother. Readers are invited along to discover if the twins will be able to win the egg-drop contest and stay in their current school. Will they win or will they have to go to the special private bougie school? Recommendation: Yes, I would recommend that a tweener, teen, young adult, and parent read this book. I always tell my students that everyone likes to see themselves in a book. With this book, someone with dyslexia just might see themselves. I am so smart that I decided to take the Dumb Test that pops up. While waiting for my results, something comes up and I agree to it just to pass to the next phase to get my results. Well, before the screen went to the other page, I saw a dollar amount. It was kinda’ wordy with small words so I didn’t really bother to read it. That was such a big mistake. I think that is what that company counts on- people not reading the fine print. I immediately hit the back button. $12.95??? For some kind of voice mail thing??? Whatever!!! I don’t remember putting down my real number. I’m pretty sure I put down a fake number, but I called anyway just to make sure. There was nothing on file. According to the customer service agent, I should not be billed. I’ll check my phone bill next month. Just in case, I asked the customer service agent what to do in the event that I do get charged and she said to call back and they would take care of it. You see how easy it is to get scammed? If I wouldn’t have noticed the dollar sign, I would have been getting hit up to the sum of $12.95 $9.99/month for a voice mail service I wouldn’t have even known was there, and that I don’t even need. I don’t remember the name of the company is or their phone number, but if you see the dumb test pop up on your screen, be smart and ignore it. All charges will be billed on your wireless service bill for $9.99/month or deducted from your prepaid balance. For help, text “HELP” to 44577 at anytime. To cancel your service, text “STOP” to 44577 at anytime. For questions, please contact customer service at care@Gatorarcade.com or call 1-800-988-6084. By subscribing to either use GatorArcade™ or subscribing to the Premium GatorArcade™ Service, you agree to receive free content and promotional offers from GatorArcade™ and to be bound by the GatorArcade™ Terms and Conditions (which includes disclaimers of warranties, limitation of liabilities and an agreement to arbitrate all claims) and PrivacyPolicy, each located on http://www.gatorarcade.com/, as each may be updated and/or modified from time to time. This has to be one of the funniest and saddest lines I have ever heard a mother tell her child. Of course it wasn’t from anyone I knew. It was from this mom on NBC’s “My Name is Earl” who wanted her daughter to be a beauty queen. According to the mom, she didn’t want her child filling her head with “useless” knowledge. The mom thought the daughter was wasting her time reading. The girl, however, had other plans. She wanted to be a doctor. This was so funny to me because it was on t.v. and I couldn’t imagine anyone expressing that sentiment. Had this been in real life, I would have been horrified that a mother would feel such disgust that her child or any child for that matter was a reading dynamo, who preferred to use her brain instead of her looks. I am so happy that I don’t have that problem. Phillise loves to read and write. I am so proud of her. Go ahead, baby. Don’t put that book down. Pick it up and read it.